US fine wine auctioneer Hart Davis Hart has announced that its September sale will be the company’s biggest ever auction, potentially realising US$10-15 million. Taking place over three days from 13-15 September in Chicago, the sale includes collections of large format first growth Bordeaux and “remarkable quantities” of Armand Rousseau and Domaine Leroy. In total the sale includes over 450 bottles of Domaine de la Romanée-Conti, 200 bottles of Haut-Brion, 550 bottles of Lafite, 510 bottles of Margaux, 75 bottles of Petrus, 615 bottles of Domaine Leroy and 425 bottles of Rousseau among many more. There are two standout collections in the sale, the first largely composed of top Burgundy, the second of blue chip claret. The Burgundy collection includes libraries of DRC, Leflaive, Ramonet and Rousseau and is estimated to be worth US$2.5-$3.8m. Over half of the Leroy at the sale is in this collection and includes large amounts of Clos de la Roche, Clos Vougeot, Latricières-Chambertin, Richebourg and Vosne-Romanée. The Bordeaux collection meanwhile, valued at $2.4-$7m, covers four decades worth of largely first growth wines, many of them in large formats. 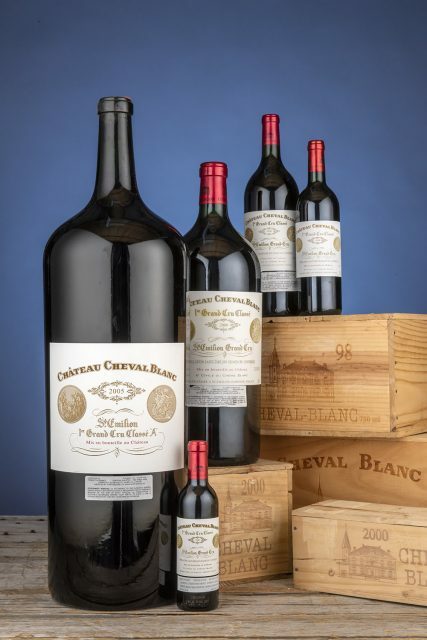 Of particular note are two 18 litre ‘Melchiors’ of Cheval Blanc, 10 imperials of La Mission Haut-Brion, 35 imperials of Lafite, 28 imperials of Latour, 34 imperials of Margaux and 31 imperials of Mouton Rothschild.